No fitting or gunsmithing required to get the increased muzzle control and accuracy of Clark's dual-port compensators and match-grade barrel. Comp helps control recoil and muzzle flip for improved accuracy and a faster follow-up shot. Match-grade, button-rifled barrel and pre-fit bushing provide a close fit on most slides for increased accuracy, function and reliability. Mfg: Clark Custom SPECS: Steel, blued. 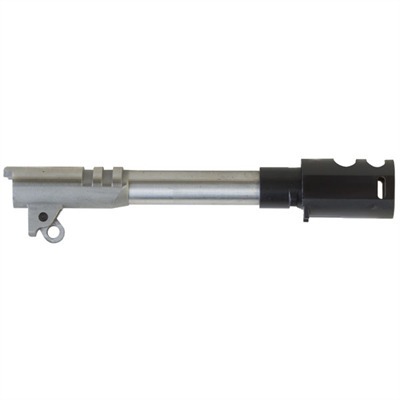 Kit includes: 5 1/2'''' (14cm) barrel, threaded .580''''-40 tpi, .45 ACP; blued comp; barrel bushing; .278'''' c-to-c link and pin. Increases pistol length by 1 1/2'''' (3.8cm). Fully chambered.